“What do you mean?” I asked my boyfriend of fewer than six months. I tried to conceal my thoughts with a Stepford Wives meets Serial Mom smile. Here's the thing: I was already the most natural I’d ever been in my entire life. Yes, my hair was straight, but it was only a temporary effect created with my flat iron and blow dryer. I didn’t wear hair extensions, fake nails, or makeup. I’d never had plastic surgery! From my crazy eyes, he could tell that my inner monolog switched from ‘quirky brown girl’ to ‘angry black woman.' Cue: hand clapping, finger pointing, and neck rolls. See, interracial dating was new for me. I anxiously searched for signs of being tokenized. I was secure in my blackness and was not here for men looking to cure their Jungle Fever or feed their low key melanin fetish. “Can you be more natural?” his words rang in my mind as I soaked in the tub. Should I? I removed my shower cap. Reaching for the nearest towel, I dried my hands and then touched my roots and the tightly coiled top bun. Sigh. Without thinking, I released my hair. I lowered my torso and head allowing the water to penetrate my follicles. I can't lie, yuh gyal was feeling like Janet Jackson in her Everytime music video. Hopping out the tub to check my hair out. I was all ‘praise hands emoji’ because my curls were popping. Team No Heat Damage! 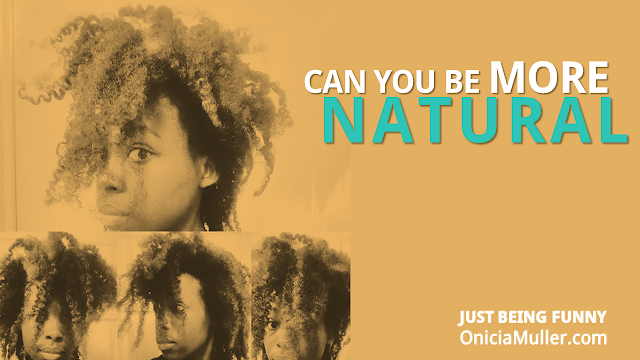 Next was the moment of truth: would I use products or give this “be more natural” thing a chance. Insert the longest sigh of your life. I skipped the products, wrapped my head in a scarf, and went to bed. Yo, the next day my hair was stuck in a Sideshow Bob confection! It was up, hard, and looking like Don King. I was late for church so I had to walk the street with this hard ashy afro. Later that night, my face is all pushed up ready to rip him a new one for convincing me to turn my hair into stone. Boo, I am not mixed. I know exactly what’s growing out of my head. That’s how I learned to not trust silky-haired friends to give hair advice. That night I spent six hours detangling and ‘un-crisping’ my hair. Never again. Meh say, never again!